Situated in the north-central part of Palm Beach County between the Atlantic Ocean and the Intracoastal Waterway, Singer Island is a 4 mile barrier island resort community. With miles of white sandy beaches and beautiful turquoise water, the island is a popular vacation destination and a perfect home for anyone who loves boating, snorkeling, diving, fishing, or simply sunbathing. Residents are just minutes from the Gardens Mall, Palm Beach International Airport, I-95 and a multitude of shops and restaurants. 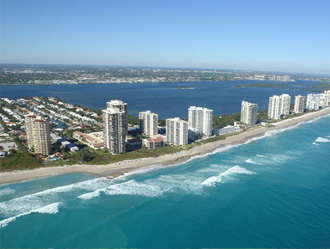 Singer Island has beautiful single-family homes and estates; however, most of the real estate on the island is in the form of mid- to high-rise condominiums. These luxurious properties afford some of the best oceanfront views in the area and offer a wide range of amenities such as swimming pools, fitness centers, and concierge services.